This pub has deteriorated. On my evening visit, the music was deafening and I had to shout at someone only two feet away to make myself heard. I can't imagine the other clientele, many of whom were 40+, were too impressed either. There were six real ales on offer, but only one of them was a standard bitter. 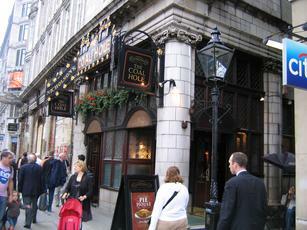 So I had a pint of London Pride which at £4.45 was on the expensive side, even for London. I was slightly short-measured. But my real problem was the quality which was awful. 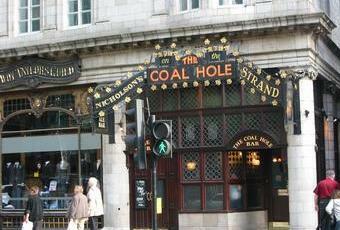 It was sour and there's no excuse for that when a large pub like The Coal Hole must have a high-volume throughput. There's clearly a problem with the cellar-keeping, although I doubt whether the mainly foriegn bar staff would have a clue what a good pint of bitter tastes like. Tourists may not know any better, but if you're a real ale drinker try the Nell Gwynne which is up an alley on the way to Charing Cross. The interior is well worth a look. Yes it is a tourist trap no question about that, but the beer quality is good (good not exceptional) and prices reasonable in my opinion, as is the pub, good standard pub food. 7/10, the average here is rather low for this pub in my opinion. 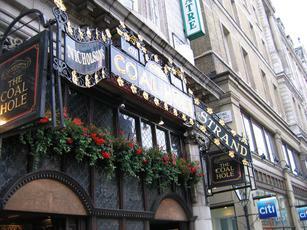 Nothing really to make this place stand out from a thousand other pubs. Everything was OK with my visit and it served a purpose. Another on my list of pubs to drop in to, another where 99% of customers are tourists, and yet it does not overdo the olde stuff. Fantastic interior, well located, and not too expensive. This visit I had a pint of Bombardier for 3.55, and it was fine. As I slowly work my way through my diary it occurs to me that the prices I paid are probably ancient history, as my visits were in July & August 2014. I include them because they give an indication of value for money, good or bad. In the case of the Coal Hole 3.55 is good value for money. Wasn't planning to go to this pub yesterday. But I popped in to see what was on after visiting the Harp. 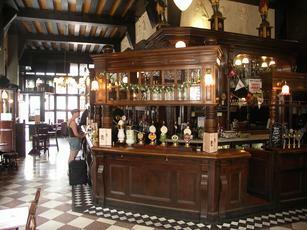 It's a Nicholsons pubs with a lovely interior. It's location will always mean it proves a hit with tourists. But the ale range is a bit more 'average' than I remember it from previous visits. That said, there is still plenty to choose from - Stewart Dakota, Oakham Inferno, Truman's Runner, Nicholsons Pale Ale, Sharps Doom Bar, Adnams Broadside & Thwaites Wainwright. Cider was Westons Old Roise. I stopped for a quick half. But in hindsight, I should have chosen the Wellington opposite (another Nicholsons, but with a more adventurous range).